Snizhne, Ukraine - It was lunchtime when a tracked launcher with four SA-11 surface-to-air missiles rolled into town and parked on Karapetyan Street. 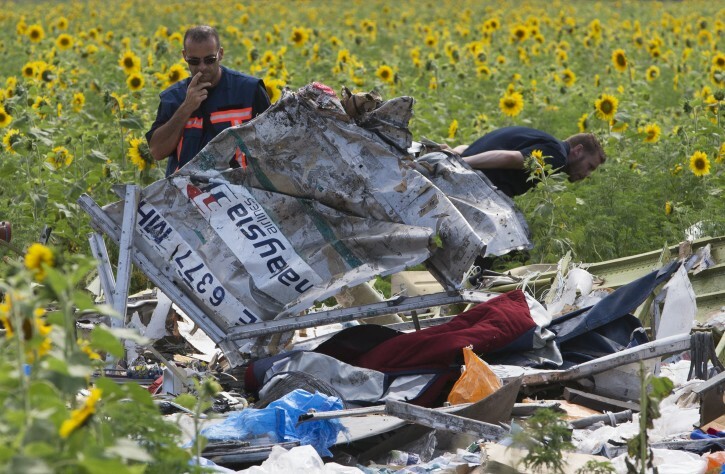 Fifteen hundred miles (2,400 kilometers) to the west, passengers were checking in for Malaysia Airlines Flight 17. The vehicles stopped in front of journalists from The Associated Press. A man wearing unfamiliar fatigues, speaking with a distinctive Russian accent, checked to make sure they weren’t filming. The convoy then moved on, destination unknown in the heart of eastern Ukraine’s pro-Russia rebellion. And then they saw pieces of twisted metal — and bodies— fall from the sky. Sergei Kavtaradze, a spokesman for rebel leader Alexander Borodai, repeated to the AP on Friday that no rebel units had weapons capable of shooting that high, and said any suggestions to the contrary are part of an information war aimed at undermining the insurgents’ cause. A highly placed rebel, speaking to the AP this week, admitted that rebels were responsible. He said a unit based in the hometown of ousted President Viktor Yanukovych, made up of both Russians and Ukrainians, was involved in the firing of an SA-11 from near Snizhne. The rebel, who has direct access to the inner circle of the insurgent leadership in Donetsk, said that he could not be named because he was contradicting the rebels’ official line. Ukraine immediately blamed the rebels for the shooting. In an interview in Kiev this week, the Ukrainian counterterrorism chief, Vitaly Nayda, gave the AP the government’s version of the events of July 17. He said the account was based on information from intercepts, spies and resident tips. The rebel official who spoke to AP did not address the question of any Russian government involvement in the attack. U.S. officials have blamed Russia for creating the “conditions” for the downing of the plane, but have offered no evidence that the missile came from Russia or that Russia directly was involved. “On that day there was a lot of military equipment moving about in town,” recalled Tatyana Germash, a 55-year-old accountant, interviewed Monday, four days after the attack. The convoy stopped. A man in sand-colored camouflage without identifying insignia — different from the green camouflage the rebels normally wear — approached the journalists. The man wanted to make sure they had not recorded any images of the missile launcher. Satisfied that they hadn’t, the convoy moved on. 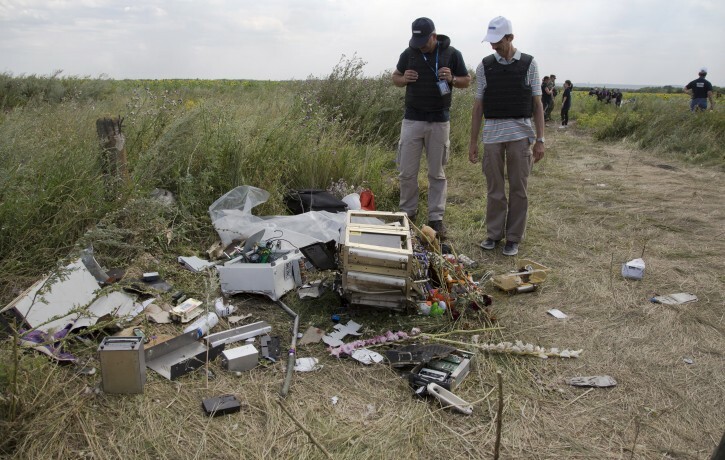 About three hours later, at 4:18 p.m., according to a recording from an intercepted phone call that has been released by Ukraine’s government, the Buk’s crew snapped to attention when a spotter called in a report of an incoming airplane. “A bird is flying to you,” the spotter tells the rebel, identified by the Ukrainians as Igor Bezler, an insurgent commander who the Ukrainian government asserts is also a Russian intelligence officer. “I can’t see behind the clouds. Too high,” the spotter replies. According to the rebel official, Sapper led a rebel unit, about half of which was made up of men from far eastern Russia, many from the island of Sakhalin off Russia’s Pacific coast. Sapper could not be reached for comment; his real identity is not known. Bezler, contacted on Friday by the AP, denied any connection to the attack on the plane. “I did not shoot down the Malaysia Airlines plane. I did not have the physical capabilities to do so,” he declared. “Just shot down a plane. It was Sapper’s group. It went down beyond Yenakiieve,” the man says. People are fooled. These are REAL Ruskie who are the "rebels." Putin put them there.